We're on a birthday roll this week sharing with you all the past birthday's we did so we can catch you up to speed. With three kids, there will be lots of birthday's in our future so we want to share these old ones with you. For my oldest son's 5th birthday we had a Transformer's theme. I found this image online and made a photograph of it with my son's picture in it. Don't mind the white out, just protecting our address. Before the festivities began we took a group picture outside of our house. Wow, a lot has changed since this pic was taken. Not only is everyone bigger (I'm talking about the kids, I have been working out, LOL,) but our house is so different now. 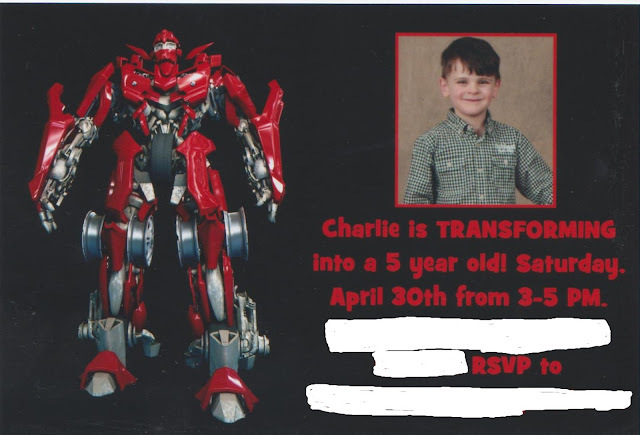 I ordered Charlie's Transformer shirt from on an online company who does personalization and I'm so sorry I don't remember which company it was. The birthday banner came from Party City. When the boys arrived they all had fun playing with the train table in the living room. And boy has our living room changed since this photo as well. This is a walk down memory lane for sure! Here is Charlie checking out his Kroger brand Transformer cupcakes. Had to pick these up since our cake was not big enough to feed all of our guests. Here are some of the kids singing happy birthday to him. For his cake I put gummy fighter jets all around. It was the closest Transformer themed decoration I could find for it. Here's my favorite 6 year old holding the Transformer toys that came off the store bought cupcakes. Inside we lots of munchies, including chips and salsa, guacamole, pita bread and hummus, a veggie platter, etc. The center piece and table confetti was also from Party City. We decided to forgo a table cloth since there were lots of little hands that might pull at it. Here's Charlie on the morning of his actual birthday eating breakfast and awaiting the opening of all these wonderful gifts. A very tired me looks on at all the fun. After a long party, my sweet boy fell asleep on the living room floor and apparently wanted to sleep next to my clog!